Petroleum coke (petcoke), a key input material for cement producers and a highly polluting fuel, is in the spotlight once again. Given its favourable cost, most cement companies switched from coal to petcoke over the past few years. On an average, more than 70% of the fuel requirement of cement makers is met through petcoke. Petcoke usage in India posted a compound annual growth rate of 24% over fiscal years 2013 and 2017 (FY13-FY17 (see chart 1). In a bid to control the high levels of pollution in Delhi and the National Capital Region (NCR), the Supreme Court on 24 October 2017 banned the use of petcoke and furnace oil in NCR effective from 1 November. 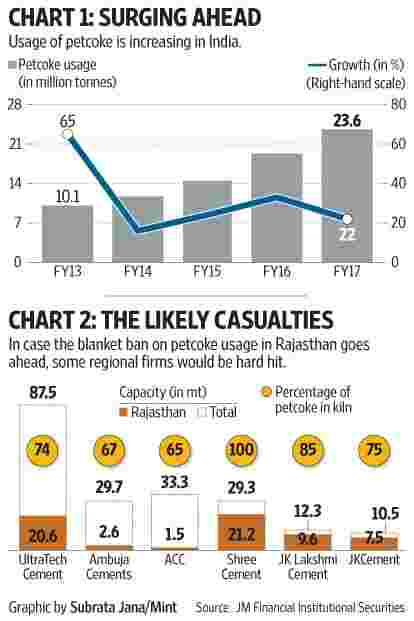 The apex court also made it clear that it would ban the use of these fuels in the neighbouring states of Rajasthan, Haryana and Uttar Pradesh if their governments did not prohibit their use in industries by 1 November. Of the three, the state of Rajasthan is significant from the perspective of cement production. It accounts for 12% of the country’s overall limestone reserves, hence several integrated/clinkerization units are situated there. Thankfully, only the districts of Alwar and Bharatpur in Rajasthan fall in NCR. Since no cement companies have integrated plants there, cement makers can heave a sigh of relief for now, say analysts. In case this order on polluting fuels is extended to the whole state over a period of time, then certain regional cement makers would have to bear a higher brunt on their operating margins compared to pan-India cement producers. As chart 2 shows, companies with high exposure to Rajasthan include Shree Cement Ltd (72%), JK Lakshmi Cement Ltd (78%) and JKCement Ltd (71%). Meanwhile, the Environmental Pollution (Prevention and Control) Authority for NCR has recommended that the use of petcoke be allowed in cement plants where emissions can be controlled. Subsequent orders from the Supreme Court and/or states on this matter would be keenly watched. On the flip side, there will be a material impact on the cement sector if the government decides to increase the cost of petcoke to reduce its attractiveness, in-line with the cess applicable on coal in the country, broking firm JM Financial Institutional Securities Ltd cautioned in a report. A clean environment cess of Rs400 per tonne is currently levied on coal. In the September quarter of FY18, operating costs of most cement companies surged on a year-on-year basis, largely due to elevated petcoke prices. Currently, the petcoke price is hovering around $105 per tonne.